FILE - President Donald Trump speaks with reporters at the White House in Washington, Dec. 22, 2017. Trump will deliver his State of the Union address Jan. 30, 2018. During his State of the Union speech Tuesday night, President Donald Trump will discuss a return "to clarity about our friends and adversaries" and his efforts "to defeat terrorists around the world," a senior administration official said Saturday. The White House is keeping mum on specifics, but officials confirmed that North Korea's pursuit of a nuclear-tipped ballistic missile capable of hitting the U.S. mainland was expected to be addressed. The annual address by U.S. presidents to a joint session of Congress usually is heavily skewed toward domestic issues. Trump's speech will be no exception. It will also be of interest to international audiences, however, as he will discuss national security, trade and immigration. Trump also will be "emphasizing the fair and reciprocal nature of trade," according to the official, who briefed reporters on the condition he not be further identified. Recent actions taken by the administration against China's trade practices are likely to be mentioned. In the days leading up to the speech, expected to last one hour, the White House is outlining Trump's proposals on immigration reform, and officials say the president, in the State of the Union address, will call for Congress to approve them despite an initial poor reception among many lawmakers. The speech, expected to be Trump's most important of the year, and the one reaching the largest audience, will primarily deal with jobs and the economy, tax reform, deregulation and infrastructure. Trump will make an appeal to lawmakers of his Republican Party and the opposition Democrats to advance his trillion-dollar infrastructure improvement plan. "He's going to talk about the need to replace depleted infrastructure," according to the official, who declined to provide additional details. FILE - President Donald Trump displays a presidential memorandum he signed, declaring the opioid crisis a public health emergency, in the East Room of the White House, Oct. 26, 2017, in Washington. Some of the White House guests invited into the chamber of the House of Representatives for the speech will personify the battle against drug addiction and the opioid crisis in America, another priority for the Trump administration. "You can expect the president will be speaking from the heart," said the official, who noted the address will be titled "Building a Safe, Strong and Proud America." Analysts have diverse expectations for the important speech. 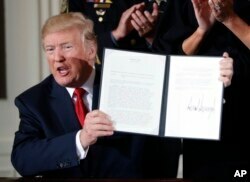 Saying that in the first year of this presidency "the world has borne the brunt of Trump's impulsive and inconsistent policies," former U.S. diplomat Brett Bruen offered that the president "would be well-advised to try to reassure foreign leaders the United States will continue to be a reliable ally and honor its long-standing commitments." Bruen, who heads the Global Situation Room consulting firm and was director of global engagement in the Obama White House, told VOA that around the world, people "want to see signs he's learned from his mistakes, even if he won't admit it. His message should be: 'Year one, I wanted to break china so we could have a fresh start. Now let's talk about what our future looks like and how we get there together.' "
FILE - President Donald Trump delivers a speech to the World Economic Forum, Jan. 26, 2018, in Davos, Switzerland. The tone on global issues in the State of the Union will echo Trump's most recent speech on the international stage, according to administration officials. 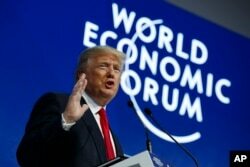 Addressing the World Economic Forum in Switzerland on Friday, the U.S. president contended that defending national interests does not conflict with the global order, saying he "will always put America first — just like the leaders of other countries should put their country first. But America first does not mean America alone." Trump in Davos reiterated his support for free and reciprocal trade, but he bluntly warned that the "United States will no longer turn a blind eye to unfair trade practices." Tuesday's speech also will be a chance for the president to build public support at home, according to Republican Party activist and strategist Morton Blackwell of the Leadership Institute, a suburban Washington organization that provides training in campaigns, fundraising, organizing and communications for conservatives. "I'm confident things are going to turn around in terms of the polls with respect to Republicans versus Democrats, and I think the president's popularity is going to go up," said Blackwell. Recent national polls show Trump's approval rating at just below 40 percent, the lowest level for any modern president at this point in a first term. FILE - People protest outside the Phoenix Convention Center, Aug. 22, 2017, in Phoenix. 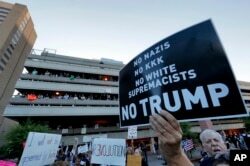 Protests were held against President Donald Trump as he hosted a rally inside the convention center. A Democrat with a centrist public policy research organization, Jim Kessler, noted "these speeches give you a bit of time to get to reintroduce yourself to voters. A lot of voters have made up their mind about him, though." Kessler, senior vice president for policy at Third Way, added that Trump "is capable of giving a decent speech," terming as excellent his address in November to South Korea's National Assembly. "The question is, how long does it last? What is the shelf life or the half life on that speech? Does it help him for seven days or does it help him for seven months?" asked Kessler. VOA's Jim Malone contributed to this report.